Pole Structure: – Installation and commission of 11kv structure consist of –DP structure, spun pole, 4pole with 11kv lighting arrestors, 11kv pin insulators, 11kv HG fuse, 11kv GOS operating systems, 11kv Rabbit conductors, and all required accessories for Sub-stations installation. Metering Cubical: – Installation and commission of 11kv metering panel with try vector meter along with CT, PT operation as per Electricity Board norms and lesion the work concerned Electrical inspectorate office. Load Breaker Switch: – Installation and commission of 11kv LBS-one way, 2way, 3way Breakers as per consumer or Board norms and lesion work with Electricity Board to obtain sanction power. 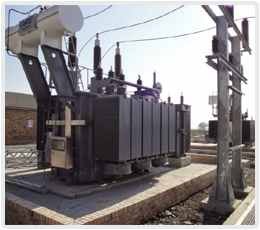 Distribution Transformer: – Installation and commission of 11kv/433v Transformer from 63kva to 1500kva or with consumer design of Copper or Aluminum wounded. Either Oil cooled or Dry type using pedestal or single or double pole structure and lesion work with Concern Electrical Inspectorate office. DG-Installation: – Installation and commission of all kinds of DG sets from 20kva to maximum rating as per consumer design and lesion work with concerned Electrical inspectorate license to run etc. Control Panels:- Design / Installation and commission of Control panels as designed by consumer like Automatic power factor control panel-[APFC], Automatic Main feeder panel-[AMF], Crane control panel, Metering panel, or any kind of customized control panel etc. CCTV: – Installation and commissioning of fixed and PTZ cameras wiring, cabling and termination, using Distribution boards, LAN, DVR etc. DG-Installation: – Installation and commission of all kinds of DG sets from 20kva to maximum rating as per consumer design and lesion work with concerned Electrical inspectorate license to run etc. Control Panels:- Design / Installation and commission of Control panels as designed by consumer like Automatic power factor control panel-[APFC], Automatic Main feeder panel-[AMF], Crane control panel, Metering panel, or any kind of customized control panel etc. CCTV: – Installation and commissioning of fixed and PTZ cameras wiring, cabling and termination, using Distribution boards, LAN, DVR etc. Communication Towers:- Installation and commissioning of Communication tower work- wiring, cabling and fixing patch card, Magnetic switch, lighting arrestors, DG cabling works, power cabling works and shutter wiring , Earthing and Aviation light fixing works & lesion work to obtain power and sanction with Electrical Boards etc. Lighting Sensors: – Installation and commission of lighting sensors, which are used for controlling and minimizing energy consumption; using light sensors wiring and testing.